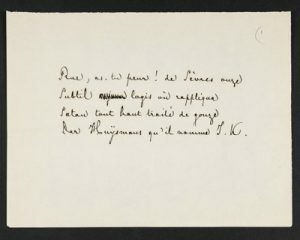 In a previous post, I wrote about the ‘Récréations postales’ by Stéphane Mallarmé: this is a series of 89 quatrain poems that each encode an address to appear on the front of an envelope. They are addressed to friends of Mallarmé from Edouard Degas to his doctor. Special Collections at the Glasgow University Library own a complete manuscript copy of this work in Mallarmé’s own hand. We’re very pleased to announce that we are launching an online translation case study using some of these poems on this site for the Decadence and Translation Network. Par Huysmans qu’il nomme J.K.
11 Rue de Sèvres (are you scared! ), a sneaky lodging where Huysmans hosts in public his old pal Satan, who calls him J.K.
At our London event, we were lucky enough to have Brendan King as a participant in our roundtable discussion of publishing Decadence in Translation today. As well as publishing translations of Huysmans’ novels with Dedalus books, Brendan has also overseen the publication of an updated version of Robert Baldick’s classic biography of Huysmans too. So Brendan was very excited to see this particular quatrain – he drew our attention to the fact that Mallarmé’s rhyme of ‘rappliqua’ and ‘J.K.’ (pronounced ‘Gee-kah’) reflects a very specific privilege. As Myriam Harry records in Trois ombres(1932), only intimate friends got to call Huysmans ‘jika’, or Jay Kay, as it would be in English. 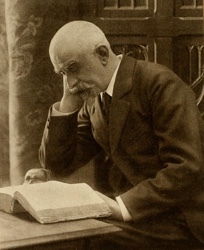 Mallarmé’s choice rhyme builds his friendship with Huysmans into the very form of the poem. Is such friendship translatable? In our case study, we’re hoping that you – our readers online from across Europe and the rest of the world – will rise to the challenge of finding ways and forms to translate these peculiar and challenging poems. We’ve posted digital scans of the manuscripts of seven quatrains with basic transcriptions and translations, along with some notes to provide background information. And now we’re asking you to post versions of these quatrains – in whatever form or language they catch your imagination – using the comment facility (‘Leave a reply’) on our site. You’ll see that one or two network members have already given it a go. We would love to hear what you make of these works: click here to explore further.